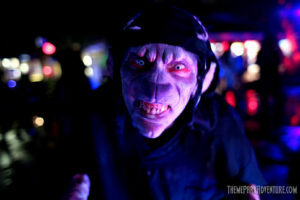 For those unfamiliar with Fright Fest,it is Magic Mountain’s park-wide Halloween celebration that features scare zones, props and thematic overlays, live entertainment, and seven haunted house/maze attractions that are available to all for an up-charge fee of about $20 or so. The park itself is huge – with a hilly terrain; thus the name “Magic Mountain“. 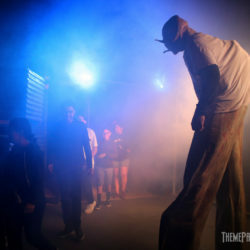 In scale, it is one of the biggest scare events on the West Coast, and it’s definitely a fantastic way for families with younger members to start “dipping their toes” into the whole haunt scene without going head-first into the deep end of the community pool. 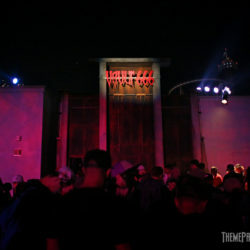 We’ve stated many times in the past that Magic Mountain’s Fright Fest seems to fly under the radar of so many fans here in Southern California, because it’s not a separate, hard ticketed event like Knott’s Scary Farm, or Universal’s Halloween Horror Nights. 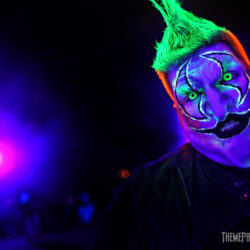 If Magic Mountain were to close the park, clear it, and then re-open as Fright Fest, I fully believe that it would draw more attention as a “serious” haunt event here in Southern California. However – and I totally get this – Six Flags feels that the “mix-in” model, which allows daytime guests to remain in the park as it switches over to Fright Fest is a great value. And no one can argue that point at all; it is a tremendous value. 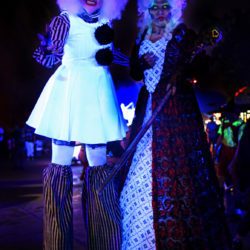 It simply changes the perception of what Fright Fest is to many potential guests, who look at it and think, “If Magic Mountain was serious about it, Fright Fest would be its own special event like the other major players in Southern California.” The corporate stance is unlikely to change any time soon, because the event brings in big crowds to Magic Mountain – which is what they want, at the end of the day business-wise. 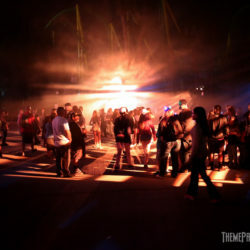 I personally would love for Fright Fest to become its own ticket for numerous reasons. For now however, that remains a pipe dream. 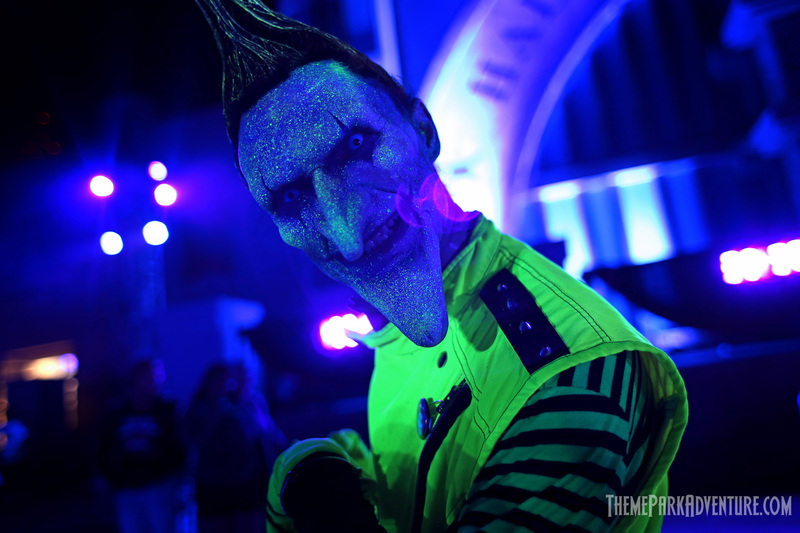 Fright Fest 2017 offers high-energy live entertainment around Magic Mountain that resonates with guests of the event. The crowds are responsive and seem to really enjoy the “dance party” feel. 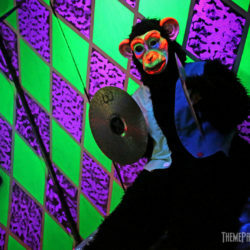 The park’s biggest production is Voodoo Nights, featuring popular DJ/percussionist Ricky Rocks, on the main stage in Full Throttle Plaza. 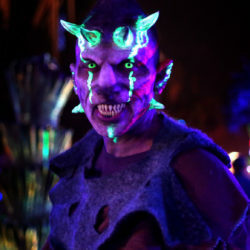 From nightfall to the end of the event, Voodoo Nights offers a great assortment of music, exciting dance numbers, monster appearances, and more. 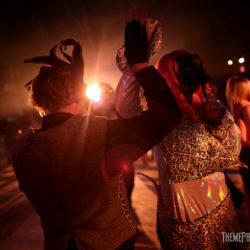 This basically becomes a pretty family-friendly “club” under the stars as folks dance, cheer, and enjoy the spectacle of Voodoo Nights. 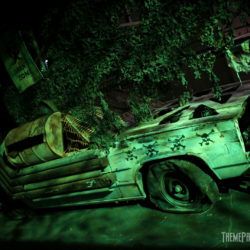 The only bummer in this case, is that the stage could be better themed/propped for Fright Fest. 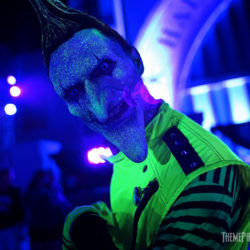 When Voodoo Nights premiered in 2013, there was more attention to theming the area and stage so that it was unmistakably part of Fright Fest. 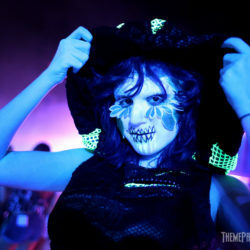 This year, while the stage is really impressive – they have an amazing lighting and sound package that ain’t cheap – there is nothing about it that feels like it’s part of a haunt event, with the exception of the performers. I’d love to see some of the original Halloween decorations return to the Voodoo Nights stage in 2018; the entertainment is quality – so the stage theming should also be in line with the Fright Fest branding. In the Golden Bear Theater, James Kellogg Jr. – also known as the High Sierra Hypnotist – entertains crowds with his comedic, interactive show that includes volunteers from the audience. 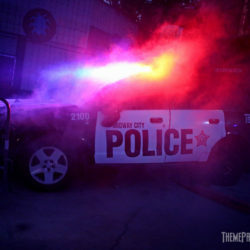 Full disclosure – we did not see this show when we visited Fright Fest. Due to the nature of this presentation, the material may not be suitable for minors, so parents should exercise their discretion in opting to see this show. Along with the new Justice League attraction that opened this year at Magic Mountain, the park also debuted a new outdoor space – the Metro Park Pub. During Fright Fest, this area has been converted to Club 6-Feet Under. Here, guests will find a covered outdoor bar with stools, and additional tables throughout the space. There is a stage, and a DJ playing music each Fright Fest evening. This is a great place to escape the crowds, have a drink, and just chill for a bit. I would definitely recommend Club 6-Feet Under if you’re in need of a break at Fright Fest 2017. 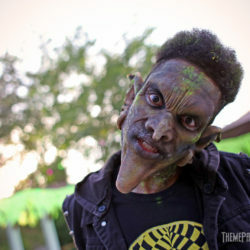 This year, Fright Fest at Magic Mountain features six scare zones, each with their own look and feel, and each sporting their own unique monsters. 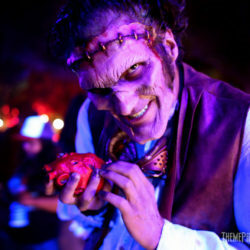 Of the major theme park haunts in SoCal, Fright Fest has the most scare zones. 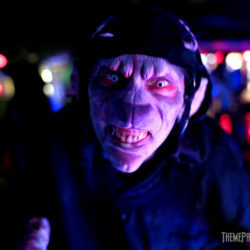 Scott Ramp of The Scream Team has been the master makeup artist behind Fright Fest’s monster looks for 25 years. 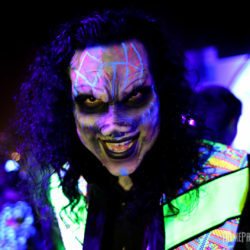 Hold that thought for a few moments – for 25 years, Scott has worked tirelessly with his teams of incredibly talented makeup artists to create Magic Mountain’s army of undead for Fright Fest. That is incredible dedication, and Theme Park Adventure applauds Scott on a job so beautifully done. 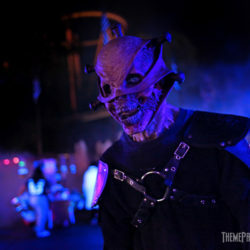 Magic Mountain is lucky to have Scott on the Fright Fest team each year, as the makeup designs he creates and the quality of artists he oversees each year truly stand out as what makes Fright Fest so visually stunning. 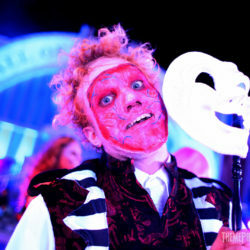 Before we move on, I want to give a huge shout-out and kudos to Scott on behalf of the fans, TPA, and Midsummer Scream. His contributions to this community as a whole are monumental – and I want him to know that we appreciate his hard work and ridiculous talent. Damned ‘N Disguise is the new scare zone offering at Fright Fest 2017, and it’s a mixed bag of good and bad. The idea behind it is really cool – a virtual “mosh pit” of monsters in the large, open area in front of Justice League. 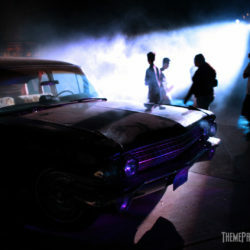 The look and feel of the zone changes as the night progresses, through show lighting and music. 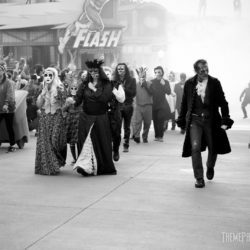 The downside to this – and it is a major one – is that it attracts what feels like every 10-13 year-old in the park, who hang out in droves following and “pestering” the talent who are trying to maneuver through the area and scare people. I’ve never seen so many loud and obnoxious kids and teens thrusting their phones (with lights on, of course) in monsters’ faces, hoping to get something cool for Snapchat or whatever. 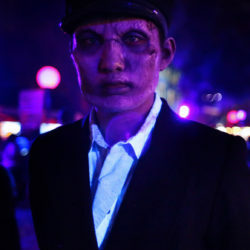 I have to say – my hat’s off to those men and women working this new scare zone – the nerves and patience have to be shredded by the end of the night. It’s truly amazing to watch these folks putting up with the hordes of excited kids for hours and not breaking character; huge props to them, for sure. The problem with Damned ‘N Disguise is also its physical footprint. 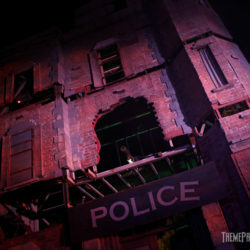 It’s just there – out in the open – with loud music playing and tons of monsters swarmed by Fright Fest guests. By that alone, it is impossible to understand any story, any theme, or any purpose other than a mass photo op. 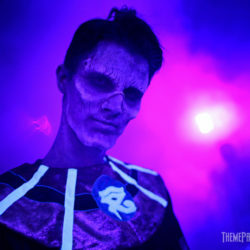 I get the idea of an evolving scare zone throughout the night – but there was no “scare” in the zone thematically, with Justice League looming as the background and what felt like hundreds of screaming, over-stimulated pre-teens under foot. It’s safe to say I prefer my scare zones to be dark, filled with fog, and themed-out. And void of young kids. Always. 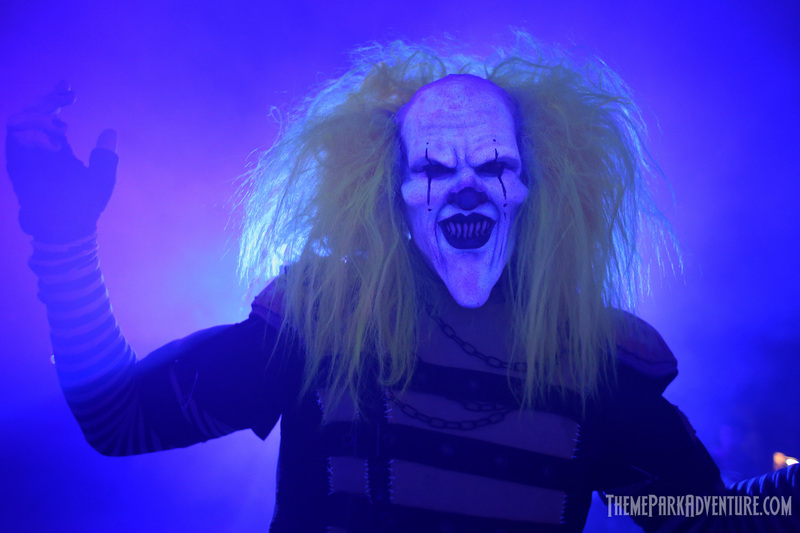 TERRORtory Twisted is the exact opposite of Damned ‘N Disguise. 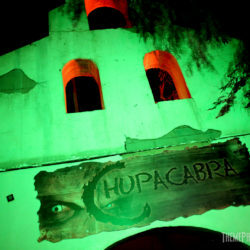 There is a cohesive element of steampunk aesthetics and creepy characters lurking in the darkness in abundance here – nicely compelmented by really cool props and vignettes placed throughout the scare zone. Except for the occasional smart-assed teen, the talent here is really free to roam and develop their own unique scare tactics. 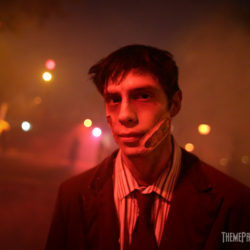 As I said when this particular scare zone came online in 2015, the shame of having it be so dark is that much of the intricate and impressive steampunk makeups are lost in the shadows. 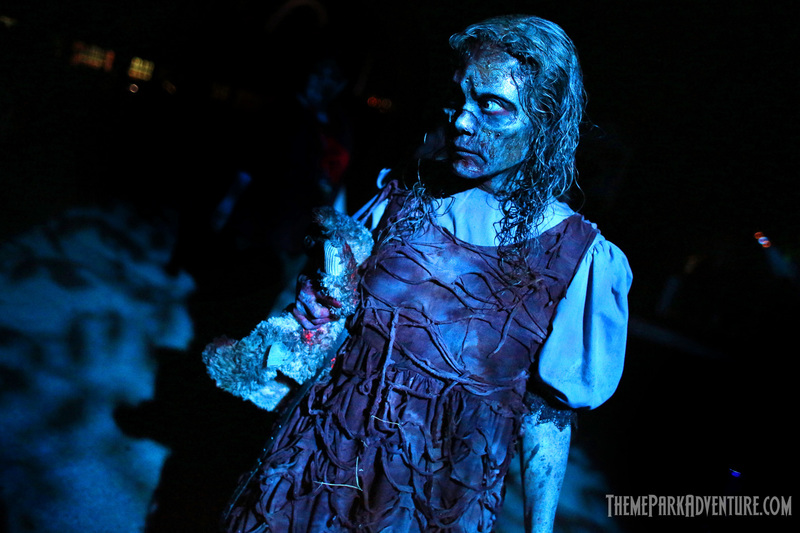 That said, we really enjoy this zone and what it brings this year – and every year thus far – to Fright Fest. 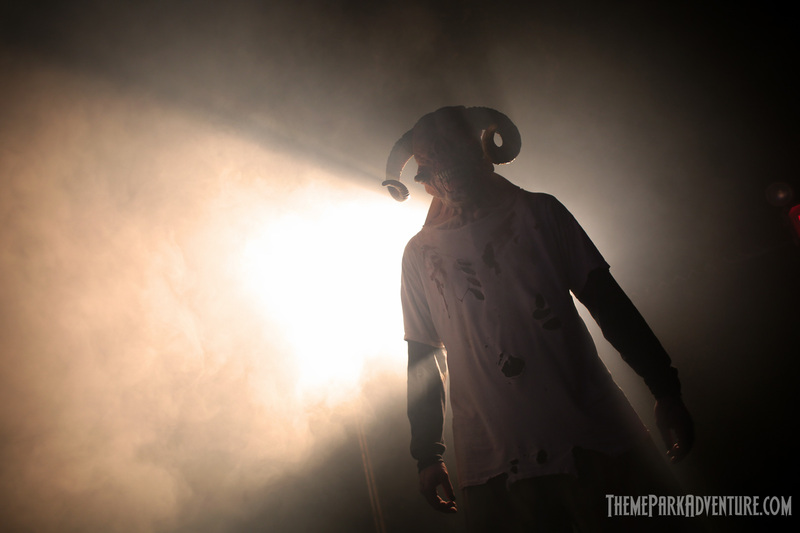 Exile Hill is one of our favorite spots at Fright Fest, because of the talent that populates it. Huge props have to go out to the character who lurks here known as “Innocence”. 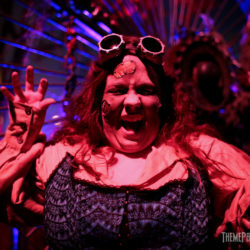 If you’ve been to Fright Fest before or even to Midsummer Scream, you have likely seen her. 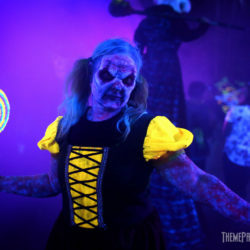 Innocence is a small female character – part of the storied Willoughby family that populates this portion of Magic Mountain’s Fright Fest event atop Samurai Summit between Ninja and Superman: Escape from Krypton. Those lucky enough to find her really are in for a treat – she moves ever so slowly, silently (usually), and very deliberate; kind of like a sloth, but without the cuteness! 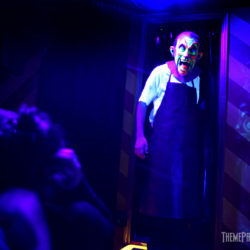 Watching this scare actor work is amazing; Innocence is at the top of our list of iconic Fright Fest characters, and I’m sure many fans would agree. I personally think she should be the “face” of the event on marketing materials, etc. She’s spooky as hell, and we love it! 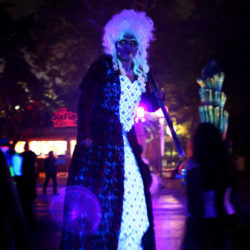 Other monsters can be found lurking in the darkness of Exile Hill as well – including some of the park’s best sliders, who leave a trail of sparks in their wake as they navigate the crowds while zipping through the shadows on their knees and hands. This is a must-see scare zone at Fright Fest. 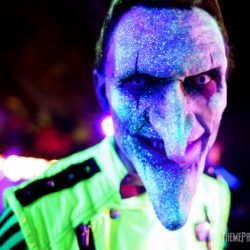 Down in the DC Universe area of Magic Mountain, guests will once again find some of the main characters from Suicide Squad. 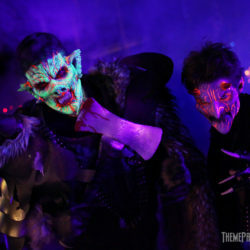 They made their Fright Fest debut last Halloween, and were brought back again this year due to popular demand. 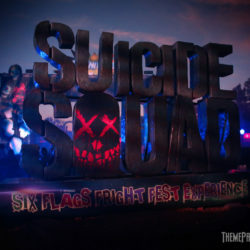 Suicide Squad: The Six Flags Fright Fest Experience is where fans will find Joker, Harley Quinn, and Katana hanging out at their separate, designated photo ops. Not necessarily scary, this IP being brought into the Fright Fest fold is interesting, and definitely popular with park visitors. The talent that is portraying these characters is spot-on; very impressive. And one can’t help but feel like a creeper shooting video of Harley Quinn as she greets guests who’ve waited in line to meet her… but I digress. 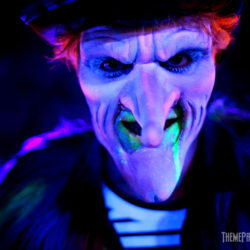 How long Magic Mountain and Warner Bros. will have this Fright Fest deal, is anyone’s guess. As long as the characters are popular, I would imagine they’ll be found in DC Universe after the sun goes down and the monsters come out to play in Valencia. 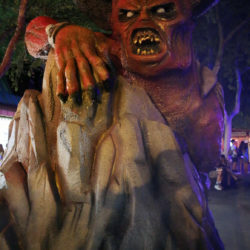 Guests entering and exiting Fright Fest must pass through the scare zone known as Demon’s Door, located at the entrance of Magic Mountain. 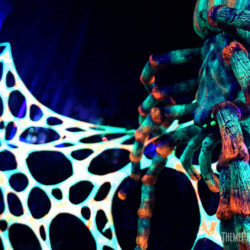 Nicely decorated with scenic props and lit with dramatic show lighting, this area plays home to denizens of the underworld – just the type of creatures you’d imagine lurking in the deepest pits of Hell itself! Small, towering, slow, and unnervingly fast, these monsters wreak havoc on guests throughout the night, and it truly is a sight to behold! 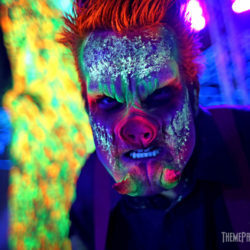 This is where some of the event’s coolest makeup applications can be found as well, so keep an eye out for these menacing creatures. 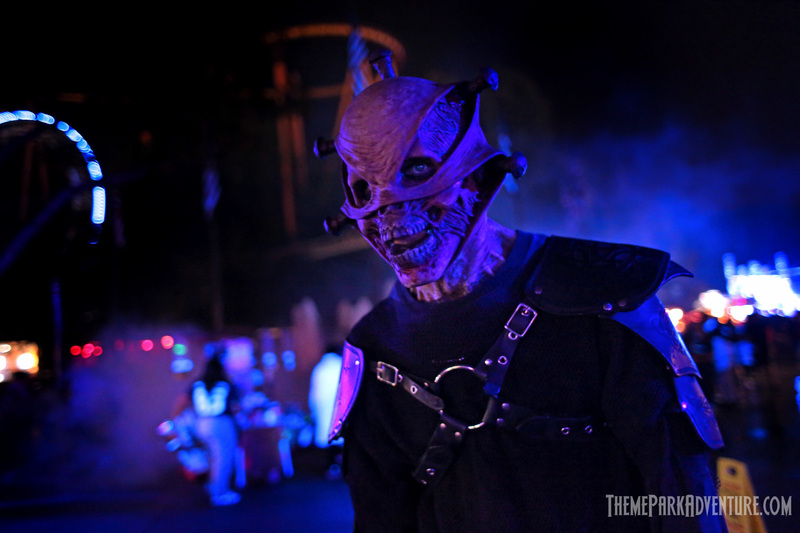 At the end of each night, scare zone monsters from all over the park come to Demon’s Door, creating a large-scale exit spectacle to end Fright Fest. Unfortunately, the same problems arise here that exist in Damned ‘N Disguise. This collection of monsters at the end of the night is a beacon to everyone in the park under 13, it seems. Once the end-of-night gathering begins, Devil’s Door’s theme vanishes and it becomes a chaotic mass of humanity that isn’t very appealing, to be honest. 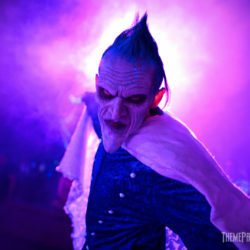 And again, I totally get it – the idea of all the monsters coming for one last scare at the end of the night is wonderful; other parks do it. 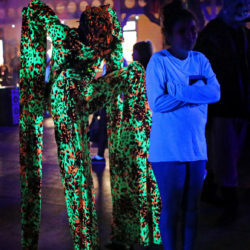 The difference is the audience you get with a mix-in environment such as Fright Fest, versus a more adult crowd that you get with ticketed events such as Halloween Horror Nights. Our favorite scare zone at Fright Fest 2017 is Nightmares: A Twisted Fantasy. 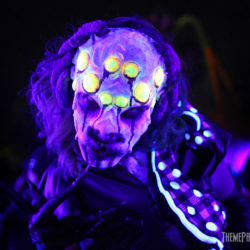 Completely lit by black light, this scare zone is populated by ghastly versions of fairy tale characters that have makeup that is reactive to ultraviolet, making everything pop brightly. Magic Mountain was the first place we ever saw this technique used on such a large scale, and we absolutely love it. 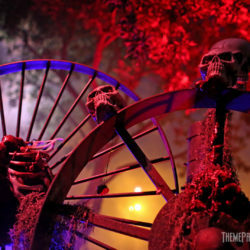 The area soundtrack is supportive, and along the walkway are numerous props and scenic elements that really round-out this scare zone experience. We could spend a long time in this area alone, just watching the really great talent do their thing. Nightmares is another must-see scare zone at Fright Fest 2017; it’s truly unique and very cool! 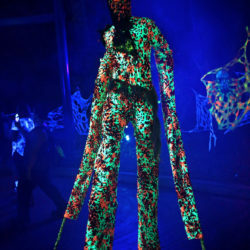 The big draw for us to any large-scale Halloween event are its mazes. 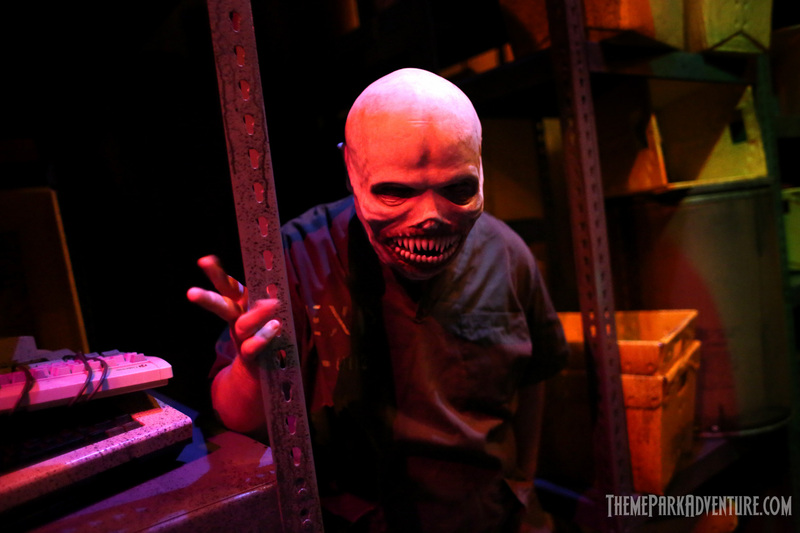 Fright Fest 2017 is no exception, with seven walk-through maze experiences to choose from. 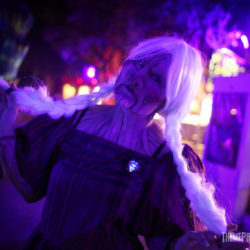 The nice thing about Magic Mountain’s Fright Fest is that the mazes are spread out all over the park, giving the event good balance, and dispersing the crowds nicely throughout the property. 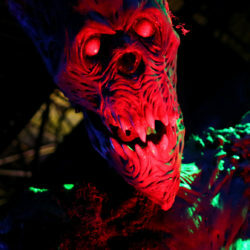 Dead End is the new maze offering this year at Fright Fest, and it’s a dark maze. 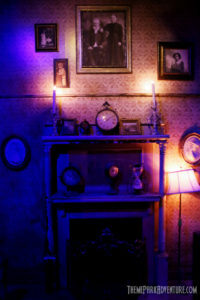 Not dark in content – but literally, it’s in the darkness, leaving guests to find their way through without their sight. Groups are pulsed, which contributes to the reasons we opted not to do this maze when we attended Fright Fest’s opening night. I know – how could we not do the one new maze this year? 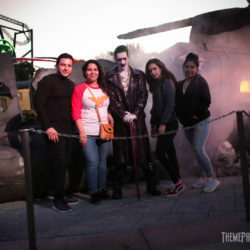 Our reasons are honest and legit: We only will visit Fright Fest once this year, and there is a lot of ground to cover as we photograph and video record everything. 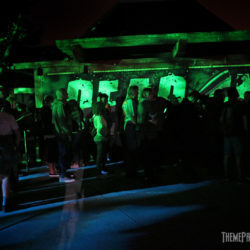 Dead End is a pulsed experience, meaning small groups are sent in – not large numbers or a conga line of guests; this means serious wait times, even for those with front of line Express Maze Passes. We had a tough decision to make – and we made it. 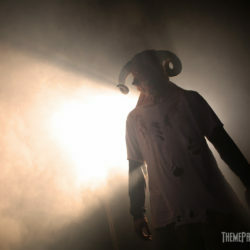 One of our primary goals of the night was to shoot the event – and there’s no shooting a maze that is pitch black inside. We’ve done numerous black out mazes before and honestly, they’re just not our thing most of the time – especially with others in the group that are going to be loud and excitable. 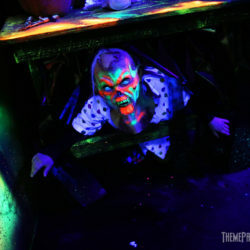 We wish that Magic Mountain had invested in a maze with great scenes and classic scares for their new Fright Fest attraction; fingers are crossed for next year. In the meantime, we’d love to hear what our fans have to say about Dead End – let us know as a comment or on social media! 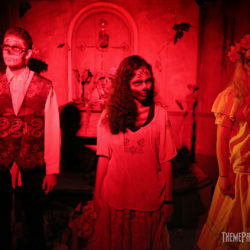 Staying up on Exile Hill (Samurai Summit), you will find the second haunted house experience – and it’s literally a haunted house! 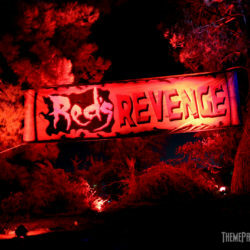 Willoughby’s Resurrected is the latest take on Fright Fest’s longest-running haunt, adjacent to Ninja. This structure – which used to house the Magic Pagoda walk-through attraction – is completely enclosed, protected from the elements. This allows Magic Mountain to maintain elaborate sets and scenes that make up this maze. 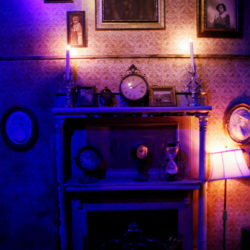 The backstory isn’t necessarily set up for guests very well, but in the end, most everyone gets that it’s simply a haunted mansion belonging to a family with the name “Willoughby”. And that’s all it needs. 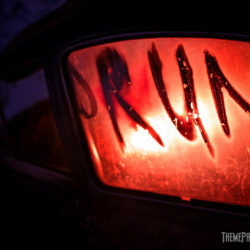 I often say keep haunt themes simple and people will get it right away and go with it. Willoughby’s is always frustrating to me personally, because it’s a gorgeous maze with enthusiastic talent – and the show lighting inside is so dim, you can barely see any of it (forget photographing or video recording). 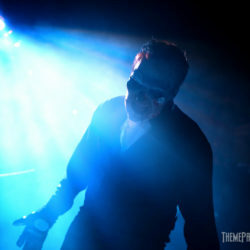 This is one of the strongest maze experiences at Fright Fest – and I think overhauling the lighting package would really make a huge difference here, and could place Willoughby’s firmly at the top of the event’s must-see maze list. 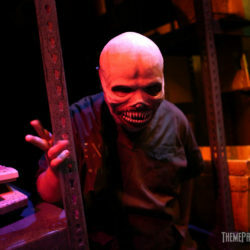 Regardless of the low lighting, this is definitely something that all Fright Fest guests should check out. 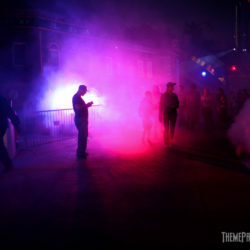 Chupacabra is located in the old queue for Revolution, and is the weakest of the Fright Fest offerings this year. It’s also one of the longest-running mazes at the event, so perhaps 2017 is going to be its final iteration; time will tell. I find this maze frustrating, because it starts out strong with a cool façade and well-lit first scene – and then pretty much plunges guests into darkness for the remainder of the experience. The talent has very little to work with, which in turn causes them to struggle finding motivation from their surroundings. The lore surrounding the fabled Latin American beast is rich and genuinely spooky; it’s a shame that it has never been exploited or really showcased in the maze bearing its name, you know? 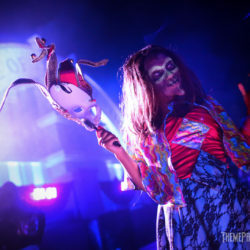 I’d love to see Chupacabra reimagined, and other Latin folklore tales such as La Llorona worked into the fabric of the theme; it could be great. Unfortunately, this year, it’s not very thrilling or good. 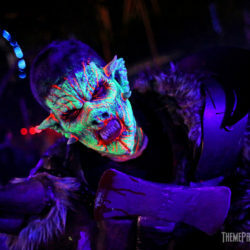 Toyz of Terror 3D is here for another year of toy factory fun – and just as its name implies, it is indeed, Magic Mountain’s only 3D maze for Fright Fest. What’s nice about Toyz of Terror is that the park has maintained it nicely, and the talent inside really does a good job. The 3D paint technique is well-applied throughout the experience, and the pacing of the maze is good, with monsters lurking around just about every corner. Magic Mountain has kept this maze around for many years now, and not much has changed (at least not in recent memory). While I’m personally not a huge fan of 3D mazes, I do like what Magic Mountain has here, and would be all for it returning again in 2018 – as long as it receives a bit of a makeover to make things fresh and new for returning guests. The line for this one can be a bit long, due to the maze featuring a pulsed pre-show, but the payoff is solid. 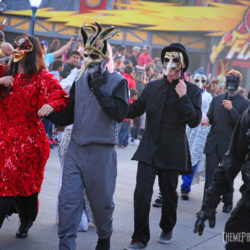 The newest maze in the Fright Fest lineup is Aftermath 2: Chaos Rising, which made its debut last year at Magic Mountain. A sequel to the very large and popular Aftermath maze, Chaos Rising takes guests on a hellish trek through a virtual war zone – between man and mutated monsters. Towering façades from the old Batman stunt show sets are the big “wow” factor for this particular attraction, which is located behind Apocalypse in the back of the park. This is definitely the event’s largest maze footprint-wise, and there are lots of monsters and scare actors lurking in the fog and shadows. Bright bursts of flame light up the night as the scene is one of destruction and despair. When everyone is in place and into their roles, Aftermath 2 is a really solid experience. The route is long and large enough that conga lines don’t typically occur here, and the staff do their best to space groups out at the beginning of the maze. On busy nights, if the line looks long – keep in mind this maze is a people-eater due to its huge capacity; your wait time shouldn’t be that bad. Definitely check Aftermath 2 out; it carries nostalgia for folks who loved the original Aftermath attraction, and it offers pretty decent carnage spectacle for those who haven’t seen it before. Red’s Revenge is back again, and the seriously pissed-off little lady is ready for more blood! 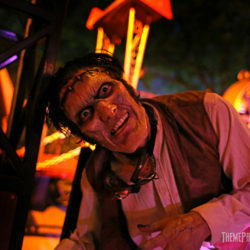 This is Fright Fest’s most elaborate maze, which debuted several years ago to rave reviews. 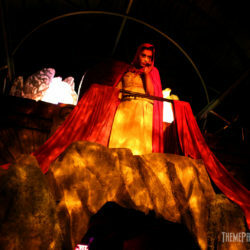 The big draw to this attraction is the scenic aspect of it – the maze is really detailed and very nicely designed. There is talent throughout, but most of the time, those folks are upstaged by their environment. Red’s features a pre-show video, which slows down capacity; there are however, two pre-show rooms that stagger the groups, and that helps to not completely kill throughput. 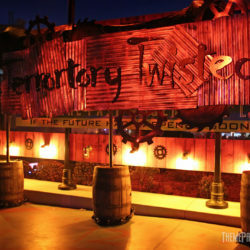 On busy nights, this maze can have a large line, so we suggest hitting it very early on in the evening when Fright Fest begins, or save it for the grand finale at the end of your evening. Since everything is so “permanent” design-wise in this particular attraction, changing things up to keep it new and fresh is a bit of a challenge. 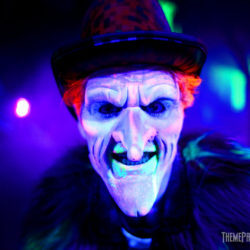 My recommendation would be perhaps introducing new character designs/talent into the maze and working it from that angle; another year, and Red’s is going to start feeling a bit stale – hopefully, Magic Mountain’s creative team will address this, because it is a really strong experience in their arsenal for Halloween! Vault 666 rounds out the maze lineup for Fright Fest 2017, and remains very popular with fans of the event, as it has been for the past couple of years. Also hidden away backstage, this maze has become one of the must-see walk-throughs at Magic Mountain. Here, guests find themselves in the midst of a genetics alteration lab nightmare, where mutated creatures have turned on their human wards. The result is a fast-paced, violent trip through the facility, where danger waits at each turn. 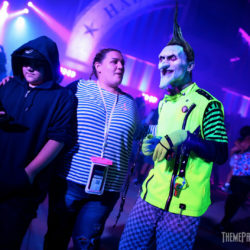 The challenge that Vault 666 faces – along with the other attractions at Fright Fest that have been there for several years – is becoming stagnant if not changed up and refreshed a bit each year. I would love to see more mutated creatures in Vault 666 – the direct result of genetic experimentation that has been going on behind closed doors. There should be a terrifying Island of Dr. Moreau vibe going on here; with the insane talent of Scott Ramp and his makeup effects team, that would be a snap; it’s just a matter of staffing, which Magic Mountain needs to look at and implement here. Given some upgrades, this maze could still have a couple more years at Fright Fest, and could easily remain at the top of its… food chain. 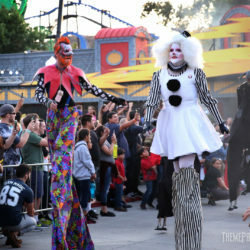 Fright Fest 2017 at Six Flags Magic Mountain is a robust, relatively family-friendly large-scale Halloween event that has once again, proven that it’s got some truly great facets that fans should check out. 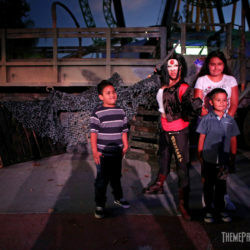 Like its neighboring large-scale park attractions, Fright Fest is an important part of the overall Halloween experience here in Southern California; there is something for everyone and plenty of time to fit this haunt into your schedule. 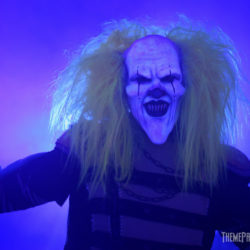 And congratulations to Magic Mountain, which was just voted “Best Theme Park Halloween Event” in the country by USA Today. In a competitive marketplace such as SoCal, that’s no easy feat. While we feel our community here on the West Coast is the overall winner when it comes to Halloween, we know that Magic Mountain’s fans are very loyal and absolutely adore Fright Fest! We look forward to next year, and to see what the future holds for this event! Kudos to everyone at Magic Mountain, and a special shout-out to the entire Marketing/PR, and executive teams for being such good friends and supporters of this community in general! 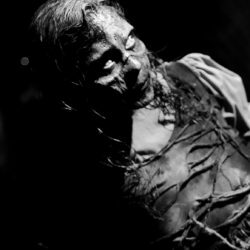 Be sure to bookmark and reference our 2017 SoCal Haunt Directory for all your Halloween haunt planning! 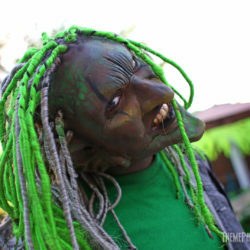 This entry was posted in Haunted Attractions, Home Page, Home Page Slider and tagged Fright Fest, Halloween, Rick West, Scott Ramp, Six Flags Magic Mountain. Bookmark the permalink.